Capture those adorable moments the old-fashioned way with today's Daily Deal - a gorgeous keepsake album for baby. Hurry, it's on at an amazing 60% OFF for today only, and only while stocks last. Simply click below to purchase. 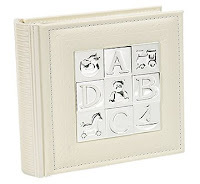 Silver plated ABC's and classic baby icons adorn the front of this timeless photo album. Holds 80 - 6"x4" photos and features a pearlized style spine. Makes a great gift for baby's shower, birth, Christening, Baptism or first birthday.